Several manufacturers names and adverts turn up on a quite regular basis, these include: Howard, Greens Mowers, Jap engines, Sheen flame guns, Tarpen equipment, Allen scythes and the list goes on, but also one other name, that of Gamages of London appears quite a lot. But who were Gamages? Their adverts appear through the 20th Century, you may have seen their adverts in old magazines advertising absolutely every tool of the time that anyone could ever need for the garden and horticulturalist as well as multiple departments for others such as household, furniture, sporting items and motoring department (including cars). Items were available from their department store in Holborn, London, think along the lines of Harrods but bigger, although even through the later 20th century Harrods were selling horticultural equipment and machines too – it was a booming market. There’s an interesting summary on Graces Guide with adverts (link) about Gamages including their rise to fame from 1878 and subsequent demise in 1972. Little did they know they’d grow into an enormous enterprise including a garden tools and machinery department, automobile and tools. 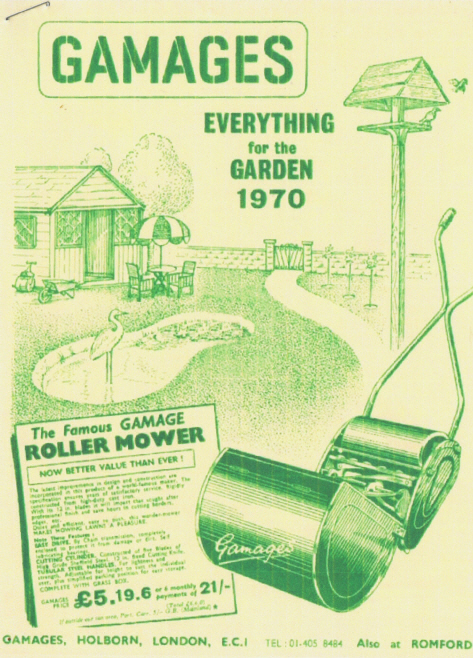 Many garden items, made by other manufacturers, bear the Gamages name, either on attached cast plates or written on as shown on the lawnmower as pictured in the 1970 brochure, right. The mower pictured actually being a Suffolk Super Swift although advertised as ‘The Famous Gamage Roller Mower’, yours for £5,19.6. Gamages produced many brochures detailing their gardening wares. Items could either be purchased in the store or via their successful mail order service. The first advert I have for their garden goods is 1910 with ‘Carriage paid to any goods station in England or Wales’. The advert having many items as well as garden rollers, image left, again advertised as being by them and probably that central cast medallion was emblazoned with their name. An internet search for ‘Gamage roller’ will show the vast range they sold which still survive to today. A few unusual makes appear in their adverts too. 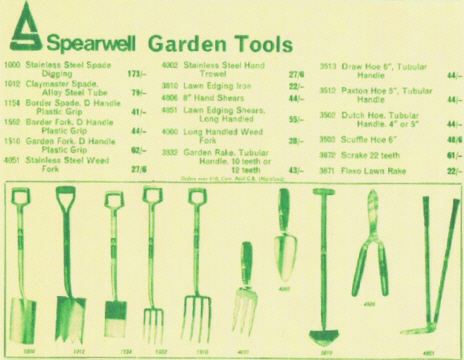 Being sold in the early 1970’s are tools by Spearwell, image below, a company I had not heard of (and had to look it up) but is a short-lived amalgamation which is now Spear & Jackson (link to VHGMC Spearwell gallery). They had three styles of hoe for sale, the draw hoe, Dutch hoe and the Paxton hoe which is double action and has a push-pull motion. 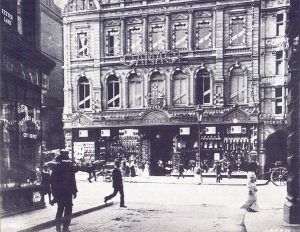 As this is a ‘Then and Now’ article, where is Gamages, the great department store? It is long gone, the great architecture of the London store and apparently rabbit-warren of departments once full of goods was demolished to be replaced by a more modern office building at the end of the 20th Century – link to Gamages location on Google Earth. 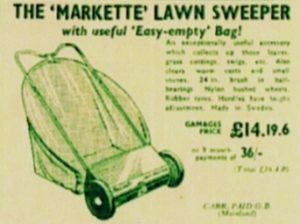 However, if a Gamages advert appears when leafing through the pages of a long-forgotten journal then at least you’ll know they sold a great many gardening goods, tools and machines which helped many gardeners between 1878 and 1972 and beyond. Indeed many of those early rollers and mowers bearing their name still exist today, perhaps there are more tools and garden equipment marked ‘Gamages’, do you have any?